The Rent-A-Car Center at McCarran International Airport in Las Vegas is an off-site facility most commonly accessed by travelers via a large network of free, airport-owned shuttle busses. Each year, more than 7 million people board the busses en-route to their rental cars, or as they return to the airport on their homeward journeys. Seeking a more effective way to connect with this captive audience for the 10-12 minutes it takes to shuttle between the airport and Rent-A-Car Center, McCarran officials turned to its media partner and agency of record, Lamar Airport Advertising. Working together, Lamar and Social Butterfly World (SBW) developed a plan to outfit the airport’s fleet of 45 busses with a new digital signage “infotainment” network referred to as AVA –Audio Visual Ambassador™. SBW has collaborated with Lamar for several years, creating marketing props, building and bus wraps, and other advertising campaigns throughout the airport. In mid-2017, SBW was tasked with retrofitting the airport’s existing fleet of busses with dynamic digital signage. Working closely with independent fleet operator First Transit, the first 25 buses are outfitted and ready to display content in January 2018, with the remainder of the fleet set to be retrofitted by Q2 2018. Content updates are distributed to the busses via Verizon WiFitowers on board each vehicle. 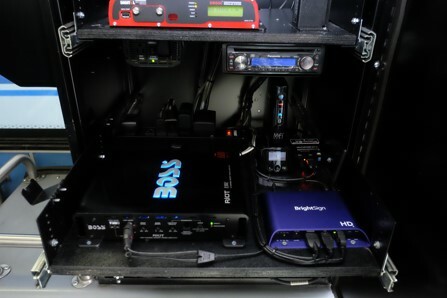 Managing and distributing content wirelessly provides a straightforward, flexible process for ensuring that timely content is always displayed throughout the shuttle bus fleet.